1. Download your free craft template and cut the base out of white card. The template is the correct size for the baskets pictured so you will not have to make any adjustments. 2. Following the template guidelines, score your paper and join together. Use the double sided tape to secure them in place. Cover the sides with your favourite Easter papers. 3. Cut out the seat for the egg, cover with paper then fix firmly into the box base with tape. 4. Trim a strip of card for the handle, cover with patterned paper and lightly bend the handle to create an arch over the basket, glue in place. 5. 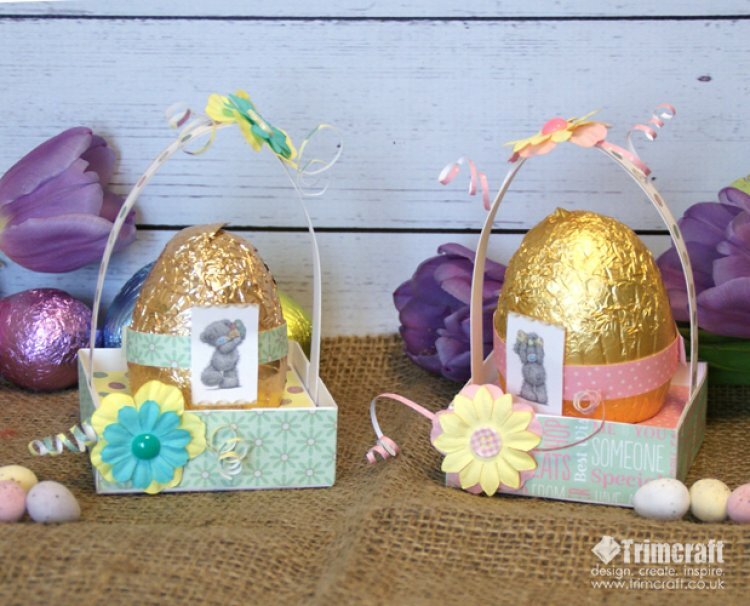 To decorate your Easter egg basket, you can add paper flowers to the handle and box. Finish by adding a pearl or button in the centre of the flower. Cut a thin strip of paper, curl with your scissors and place under the flower with tape to complete your basket. 6. To make the paper band on your Easter egg as pictured, cut a 1cm strip of paper, long enough to fit around your egg, stick in place with tape. Cut out a Me To You Tatty Teddy from one of the character pages and place in the centre of the band and secure in place. With the charming spring colours and adorable Me to You Tatty Teddy character, these baskets make a fun and original gift this Easter. Share your Easter projects with us in the project gallery.